Everyone is looking for that memorable stand-out gift. But, what are the components needed in order to create that moment? Well, if in real-estate it is all about Location. Location. Location; in gifting it is all about Surprise. Surprise. Surprise. That’s why a surprise is not enough! We need to accelerate that surprise into a shock! “That was nice”, or “thank you” are OK reactions. An “Awesome” or “WOW” reaction is needed in order to create a memorable moment! Wait, that is still not enough. After all, the shock moment is only a moment! It is still possible to slip by. We need to turn that moment into an experience! That’s where the concept of Shock and Share comes into place. Sharing a shocking moment is reliving it all over again! Sharing a moment creates a new shock for those we share with, thereby ensuring it is unforgettable. The moment turns into an experience engaging dozens of people. It is no longer dependent on the recipients’ memory. It’s kind of tough to forget such an experience! 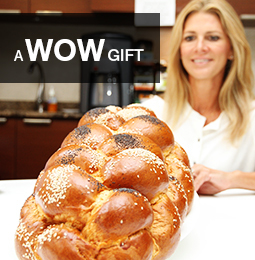 We only realized the Shock and Share concept after we received the feedback of our WOW Challah. People kept on talking about how they shared the Challah. How the WOW Challah became a conversational piece. That’s when we realized the importance of sharing a shocking moment! It became crystal clear that sharing is an integral part of creating that memorable moment! So, the first component needed is to accelerate the surprise into a shock! The second component is to create a shareable experience! Now, your asking what else can you do in order to ensure that shock experience? – Send the gift to your friend’s workplace! This is an awesome way to expedite the shock and share experience, since the recipient’s co-workers now all share in the experience! – Send the gift when least expected: How about the weekend before that special day! Remember shock reactions are rare, they only happen when something is totally unexpected! – Send a personalized note: “Thank you” or “congrats” are standard and boring. Find something personal and put it in one or two lines. Shock your friend with your genuine friendship! Gifting is all about showing you care. Remembering your friend’s special day in a special and memorable way. Be innovative and enjoy the experience of creating shocking moments!